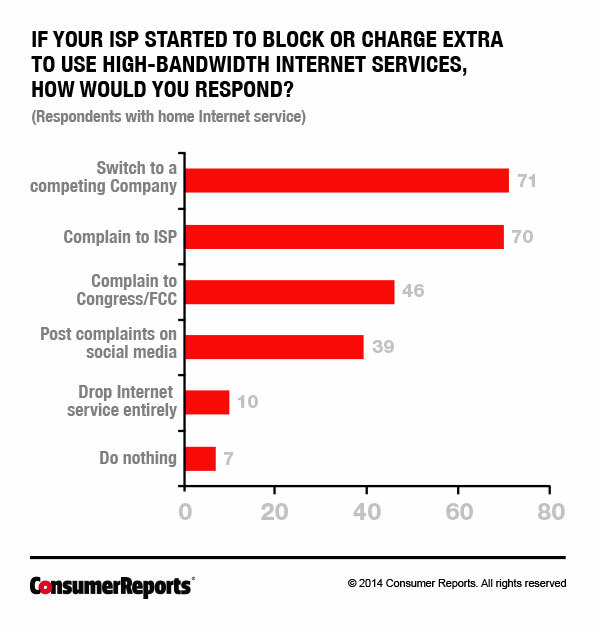 Last month, a federal court ruling in Verizon v. Federal Communications Commission essentially dismantled much of the FCC’s Open Internet rules, which forbid ISPs from blocking or discriminating between different types of traffic over the network connections they provide to customers. Specifically, those rules meant that ISPs such as Verizon, Comcast, and Cablevision couldn’t treat popular high-bandwidth video and audio streaming services differently from any other Internet traffic. Now, technically, ISPs can manage high-bandwidth traffic as they see fit. The FCC is now considering whether to appeal the decision, revise the Open Internet rules, or maybe even reclassify ISPs as “common carriers,” which would subject them to a different level of regulatory scrutiny. There is sure to be more debate and turbulence on this issue (and changes may come as soon as this week). But as both regulators and service providers plot their next moves, the public has officially weighed in.